Los Planes , is located in Drake Bay in The Osa Peninsula, just three miles from Corcovado National Park, only 15 minutes from Playa Colorada (Agujitas) Agujitas Drake is right on the center of Drake Bay, there you have easy access to health center, school restaurants, Hotels, bars, rural guard, among other. You can get there by 4x4 car, plane with Sansa and Nature Air or easy drive to Sierpe de Osa and being there take a boat over the Sierpe River. Los Planes has a population of 360 people about 75 families, who are dedicated to tourism, 90% agriculture, and conservation. The school is located only 200 meters from the property; there are two grocery stores. Town has electricity, telephone, Internet; property has a public street in front of approximately 400 meters. The green area, the House Garden is made up mainly of heliconias, bougainvillea, poppies, cactus, and fruit trees such as mango, cashew, orange, guava, pineapple, green coconuts, cassava, bananas, cane, avocado, papaya, lemon, and tangerine. Different species of Medicinal plants such as mint, ginger, nonis, oregano and almond. The forest area is 20 ha of primary protection and the other part is pasture, built up areas is the house room, laundry, reception canopy tour, poultry, and small winery and farm. Property Property has a two-story house, two rooms, living room, kitchen, bathroom, and laundry, also has a small farm of 150 chickens producing. A beautiful horse, some cows. animals are not in the price of the sale, but it could be negotiated. 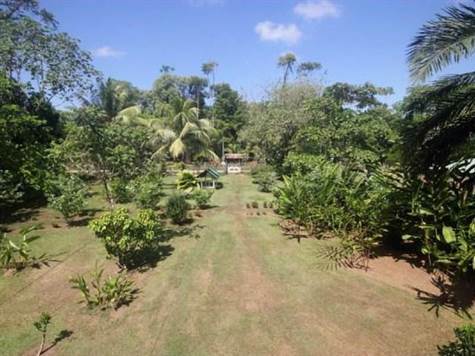 Total land is 29 hectares, or 72 acres! Commercial Corcovado Canopy tours was built in the property primary forest, it has a spacious reception , which welcomes tourists and are prepared for the tour, it has two public bathrooms, an office, storage for the equipment used, and a room with private bathroom. The Canopy has 12 cables, 14 platforms, a suspension bridge 51 meters long, and a palm hut 6 x 6 which is the last platform where the adventure ends in total travel is two and a half miles in cables and it was built 4 years ago, and we give our tours services to more than 11 hotels that are located in Drake Bay.